Aleksander With took Norway by storm when he became the youngest Idol winner ever in 2006. His debut single ‘A Little Too Perfect‘ shot to the top of the charts, with follow-up ‘The Other Side‘ getting to an impressive number two a couple of months later. 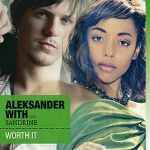 These days Aleksander is already up to his second top five album and is looking to make it big outside of his own country. To make this happen Sony is launching him abroad with the song that got him another Norwegian top three hit. ‘Worth It‘ was originally a duet with Lene Marlin, who is also a co-writer on the accompanying album ‘Still Awake’. It goes without saying that Lene is still as lovely as ever. However, for the Belgian and Dutch releases Aleksander has teamed up with some local talent to cover Lene’s lines. Sandrine came third in Idool 2004, but her music career outlasted both finalists Joeri and Wouter. Her biggest hits in Belgium include ‘Goosebumps‘ and the Eurosong 2008 entry ‘I Feel The Same Way‘. Sandrine spent last summer promoting ‘Run Away‘ and packing her bags for a trip to America from which she hopes to return with a third album ready. A sample of her rendition of ‘Worth It’ can be found here. The singer to take on Lene’s vocals for the Dutch market is, just like Aleksander and Sandrine, an Idols alum. Nikki Kerkhof has left the sound of her 2008 winner’s single ‘Hello World‘ behind and is now The Netherlands’ hardest rocking talent show winner. Her two albums were fronted by pop/rock anthems like ‘Bring Me Down‘ and the Guy Chambers and Busbee penned ‘Can’t Stop Thinking About You‘. The full Dutch version of ‘Worth It’ had his radio premiere, but isn’t up on YouTube yet. For now though, there’s the sample below. I’m curious to see if the addition of these two Charley says POP! favourites will do the trick for Aleksander in the Benelux. I for one hope it does! Oh, and while you’re at it, Aleksander, how about local versions for France, Spain, Germany, Italy and so on? PS: Look out for the interview I had with Nikki a couple of weeks ago, coming soon to Charley says POP! Yesterday I spent some time watching the audition episodes of My Camp Rock on the Belgian Disney Channel site. My Camp Rock is a co-production between Belgium and The Netherlands. Inspired by the movie of the same name the show is looking for a new kid or teen singing sensation. The show is hosted by talent show veterans Dean and Sita. Dean won Idool 2007 in Flanders, while Sita won a place in the band K-Otic on the Dutch show Starmaker back in 2001. Head of the judges is vocal coach Babette Labeij, who works on all the big Dutch talent shows. Earlier this year she released an album of her own, fronted by the amazing pop/rock single ‘Stupid Woman’. Local adaptations of My Camp Rock have already aired on various Disney Channels around the world. British winner Holly-Anne Hull got her trophy handed to her by Demi Lovato and Martina Russomanno from Italy was even joined by Joe Jonas himself on winner’s song ‘This Is Me‘. I only found one series where a duo won. Cynthia and Félix released a translated cover of ‘We Rock‘ after winning the French version of My Camp Rock. It’ll be a while before we find out who wins for Belgium and The Netherlands, as for some reason the next few episodes will only air at the end of August. What we do know is that there is some Junior Eurovision talent taking another shot at stardom. Among the participants were duo Cheyenne & Mayleen, who reached the Dutch national final in 2009 with ‘Druk‘. Also present were semi-finalist Haruka and runner-up Manou from Belgian Junior Eurosong 2009. While we’re talking Camp Rock, my favourite cover from this movie has to be Nikki’s version of ‘This Is Me‘. Having just won Idols at the time, the Dutch singer recorded this video to promote the movie’s then upcoming release.